Learn what to do when you find kittens outdoors. Learn more about kittens and their needs as they grow in our Kitten Guide. When kittens are first born they are completely helpless—their eyes are closed, their ears are folded, and they can’t stand, keep themselves warm or eat on their own. They rely on mom for everything! When kittens are first born, they are helpless—they cannot see, hear, keep themselves warm, or eliminate waste on their own. They fit in the palm of your hand and weigh 3-5 ounces. Kittens like Darling, and his siblings, are completely dependent on their mother (or you!) for protection, warmth, and nutrition. Even so, these kittens can purr and make distress calls. They spend 90 percent of their time sleeping and the other 10 percent eating. Want to learn more about kittens and how to care about them in the first week? At the end of the first week, Darling is starting to become more aware of his surroundings. At one day old, the kittens cannot stand. Their eyes are closed and their ears are folded. Kittens this young require round-the-clock care and bottle feeding every two hours. Denby is just a day old. Notice that the kittens’ ears are just beginning to unfold, though their eyes remain closed. Their sense of smell, hearing, and taste are slowly starting to develop. Tweed is only three days old. After almost a week, the kittens begin to wiggle around on their own a little bit and their eyes start to open. Cordory at six days old. One week in this world, Darling, Denby, Corduroy, Tweed, and Wembley are becoming more aware of their surroundings. Their eyes are almost completely open, though their eyesight is still unfocused. They have doubled their birth weight to around eight ounces. At about seven days old, a kitten’s ears will unfold. Wembley is one week old! During their second week, Darling, Denby, Corduroy, Tweed, and Wembley continue to grow by leaps and bounds. By the end of the week, their ears will be almost completely uncurled and they will begin to crawl. They still depend completely on a caregiver—either mom or you—for food and waste elimination. Want to learn more about kittens and how to care about them in the second week? Look at those blue peepers! Darling’s eyes are fully open, and he is taking his first wobbly steps. The kittens snuggle together for warmth and comfort and rarely venture far from mom, their nest, or each other. Eight days old! All the kittens pile together. Corduroy on day nine.Look at those blue eyes! The kittens are becoming more comfortable venturing away from mom, though they are wobbly on their feet. Wembley is twelve days old and starting to move around. Now that Darling, Denby, Corduroy, Tweed, and Wembley are more aware of their surroundings, they are beginning to interact with each other, but still need mom. Their sense of smell is developing, and they will hiss at unfamiliar scents or sounds—though the tiny sounds that come out are most likely not as ferocious as they think! They are also kneading, though they cannot yet retract their claws. By the third week, you can tell if the kittens are boys or girls. (Darling, Denby, Corduroy, and Tweed are all boys; Wembley is the only girl). Their teeth are coming in and their walking is becoming more confident. You can start providing a litter box and wet food. At the end of his third week, Darling’s now playing with his siblings and getting more mobile. Want to learn more about kittens and how to care about them in the third week? Even at this age, the kittens still spend a substantial part of their day sleeping. The kittens are just beginning to play and develop their fine motor skills. Wembley is up and about on day 16. Kittens this age can start to eliminate waste on their own, without the help of mom or a caregiver. Now that the kittens have reached this milestone, it’s time to start litter box training. If you are bottle feeding, you’ll notice the kittens are drinking much more at each feeding, but at fewer feedings, probably four to five times a day. At this age you can start introducing solid food—use wet food at first, and try mixing it with kitten formula. By the end of the week, their weight will have increased to close to 15 ounces. They are walking steadily, without too much wobbling. Tweed is three weeks old! Look how much Darling has grown! At four weeks kittens are sturdy on their feet and playing with each other, toys, and people. By now, Darling, Denby, Corduroy, Tweed, and Wembley look like fluffy, miniature versions of their mother. They are showing interest in the outside world, interacting with their littermates more and also beginning to interact with people and toys. That means it’s time to begin socializing these kittens! Want to learn more about kittens and how to care about them in the fourth week? Notice that their ears are fully extended and they are holding themselves up well. They are sturdy! Their fur is beginning to fill out and you may be able to tell who will have short, medium or long fur. These kittens all have short fur. Who wants to play? Playing is a great way to socialize kittens and teach them fun and positive ways to interact with people. Get tips on how to socialize kittens at alleycat.org/Socialization. It’s been one whole month! It’s amazing how quickly these helpless kittens have grown up over a four-week period. Darling, Denby, Corduroy, Tweed, and Wembley are thriving babies, starting to explore the world around them and play frequently with friends and toys. At four weeks old, Corduroy is ready to explore! Get ready for a lot of fun! Darling is now full of energy and plays exuberantly. He developing lots of personality! This is when the fun begins. Now that the kittens’ sight is fully developed, they are engaging in vigorous and exhaustive play, running around and exploring until they quite literally fall asleep right where they are. While they are experimenting with solid food, kittens like Darling, Denby, Corduroy, Tweed, and Wembley are still nursing from their mother (or being bottle fed by you) a few times a day. Interacting with people is important for kittens at this age. Want to learn more about kittens and how to care about them in the fifth week? Exuberant play means tired kittens! Play—with each other and with you—is an important part of kitten socialization because it helps them bond with each other and build confidence around people. The kittens are being handled by people early and often to encourage their social development. Getting love and play from humans helps them connect positive experiences with people—something that will help when they are adopted into new homes. Showing their independence, Darling, Denby, Corduroy, Tweed, and Wembley are beginning to demonstrate their individual personalities: Darling is a talker; Denby is always up for adventure and a good wrestle; Corduroy is brave and confident; Tweed is sweet and loves belly rubs; and Wembley is a cuddle bug and full of silly mischief. Every day Darling is getting more sure of himself through socialization and play. He’s using the litter box and eating cat food – though he still visits mom for snacks and comfort. Continuing to socialize the kittens only gets more important as they grow. This is the age when the people caring for Darling, Denby, Corduroy, Tweed, and Wembley and the rest of their cat family begin teaching the kittens how to play, letting them know that human hands are not for biting or scratching. Want to learn more about kittens and how to care about them in the sixth week? No longer wobbly on their feet, the kittens have found stability using their tails to help balance. The kittens are stalking, hiding and pouncing, and digging—instinctual behaviors ingrained in all cats, whether they grow up indoors or outdoors. The kittens are now proficient at cleaning themselves, having learned it from birth from their mother. They are also grooming each other, reinforcing the bond between siblings. Incorporate grooming into your interactions with the kittens—especially if you have a single kitten, or you are raising a litter without the mother cat. Tweed, Wembley, and Denby at six weeks old. Darling is almost fully weaned and continues to play and learn. The kittens are almost fully weaned and continue to play and learn. Being introduced to new people, places in the home, and other pets is an important part of socialization. They are pretty self-sufficient at this point, though Darling, Denby, Corduroy, Tweed, and Wembley still get comfort from mom. Want to learn more about kittens and how to care about them in the seventh week? As part of socialization, the kittens are being introduced to different parts of the house, different objects, different pets and people, and different experiences—all to help them adjust to new situations. Corduroy, curious and looking forward to new experiences. The kittens have been introduced to scratching posts and had their claws trimmed for the first time. Training the kittens to understand these routines helps prepare them for their new homes. Wembley is comfortable with her routine. Almost fully weaned from mom, the kittens are growing up! These little kittens are hitting their stride and becoming independent. Denby is almost fully weaned and is eating regular food. Two pounds! Darling now weighs enough to be neutered. He’s also getting more skilled and adventurous. Darling is learning so much from his mom, siblings, and human caregiver. At this point, the kittens’ caregivers started looking for their adoptive homes. The kittens are fully weaned from their mother, but their continued development and growth together is important enough to put off adoption for another couple of weeks. Want to learn more about kittens and how to care about them in the eigth week? This is the height of the kittens’ eye-paw coordination and play activity, leading them to try more daring and complex feats. It’s a good idea to keep a close eye on them during this time and ensure their play area is safe for budding daredevils. Corduroy playing with his new toy! At two months the kittens weigh about 2 pounds and can be spayed or neutered. Tweed at 8 weeks old. Looking pretty grown-up, Darling! At this age kittens are behaving and using their body language like adult cats. Darling is eating all solid food, and his eyes have gone from blue to yellow. By nine weeks, the kittens are clearly showing an attachment to their caregivers, cuddling on laps and seeking out attention. 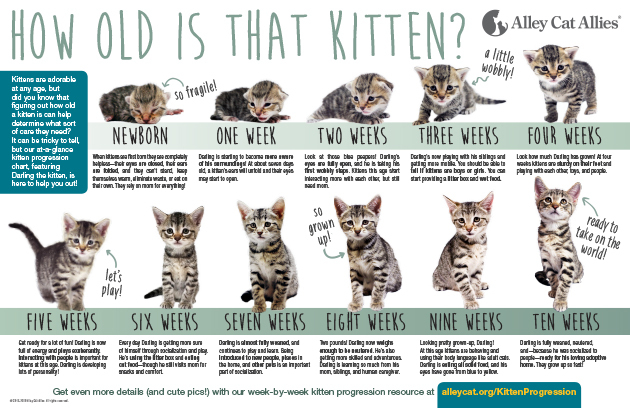 Want to learn more about kittens and how to care about them in the ninth week? Their adult eye color is clear now: Darling, Denby, Corduroy, Tweed, and Wembley all have yellow eyes. As they start to look more and more like adult cats, the kittens’ growth rate is finally beginning to slow. Though they will continue to develop muscle tone and stealth, they won’t be doubling their weight in a matter of days or weeks anymore. Denby is starting to look more adult. The kittens are on more of a schedule now, sleeping and eating at regular intervals. They eat mostly solid food, and mom is close to being done with the occasional nursing that may still be going on—if you were bottle feeding, you’re probably done by now. Tweed still goes to mom for comfort, but is eating solid food on his own. The kittens are exhibiting all of the behaviors of adult cats, using their body language to communicate with their caregivers. Darling is fully weaned, neutered, and—because he was socialized to people—ready for his loving adoptive home. They grow up so fast! It’s so hard to say goodbye to these adorable kittens, but Darling, Denby, Corduroy, Tweed, and Wembley are fully weaned, socialized, spayed or neutered, and have found loving adoptive homes. Saying goodbye to kittens is always hard—they grow up so fast! Want to learn more about kittens and how to care about them in the tenth week? Visit our Kitten Guide.